Am feeling yucky this morning ... it has been getting consistently worse since Monday. I'll be calling my doctor shortly and keeping fingers crossed it's not Malaria - only cause it's less than 2 weeks since I got back. In which case this will be a very short post cause I'm hoping to get out of work in the very near future. 10:40am - okay, I'm pretty sure it's not Malaria, based on the Wikipedia symptoms of fever, shivering, joint pain & vomiting - I just have a sore throat. I had previously heard you should have any flu-like symptoms checked out in the 2 weeks after being in a Malaria area. Plus, my doctor is on leave today ... I'll call her again tomorrow. 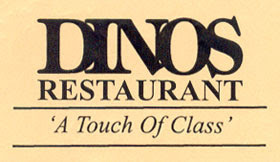 Had a lovely dinner at Dino's last night for Varen's dad's birthday. Was nice to see his whole family again since I haven't since before my trip. The restaurant was good, my Spicy Calamari starter was fab and so was Varen's Crocodile tail steaklet starter. Unfortunately I don't think I picked my main course very well (Springbok and Pheasant Pie - based purely on the most divine Springbok Pie I've had at Pomegranate previously) and it wasn't as impressive. Thrilled to know I'd be missed :) Thanks guys!